At Wofford College we had several LA-36 DECWriters. These printing terminals were nice to use while programming because you could get a hardcopy of your work-in-process. 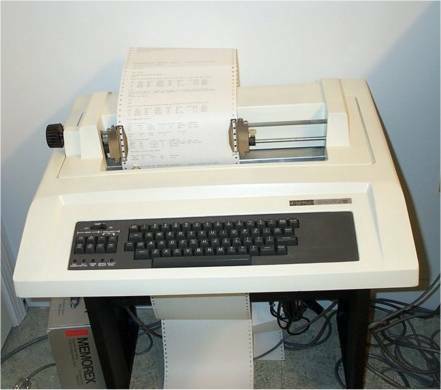 I have one nice clean LA-36 DECWriter connected to the PDP-11/40 as part of the Wofford Witch environment. 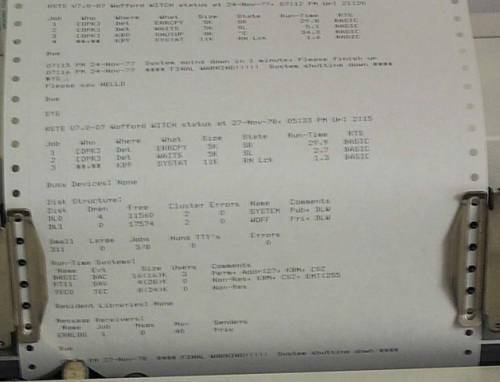 The close-up picture above is an LA-36 printout from $SYSTAT on the Wofford Witch reincarnated system. 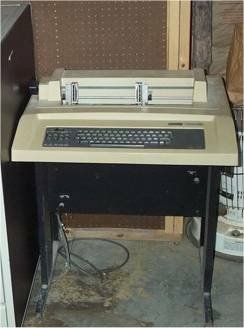 In 1978 and 1979 I used an LA-36 and a program named LISTAL.BAS by Paul Koning of Lawrence University to print all of the programs from the original Wofford Witch system. Those program listing proved to be quite valuable during the process of reproducing the system because they contained all the custom modifications that were implemented at Wofford, as well as games, science and math programs, and system utility programs that we used. I also have three additional working LA-36 DecWriters, and another LA-36 DecWriter that has three toggle switches on the left side of the keyboard instead of the push button controls.